It was a crisp cold December night. Cara Knott was travelling southbound on Interstate 15. Cara had been on her way home from an evening at her boyfriends home in Escondido to her parents home in El Cajon, California. Craig Peyer, on duty CHP patrol officer, flashed lights at Knott to pull off the freeway to an isolated off ramp. It is thought the situation with Knott became physical when, she threatened to report Peyers behavior. Peyer beat her with his flash-light, and strangled her with rope from his patrol car. 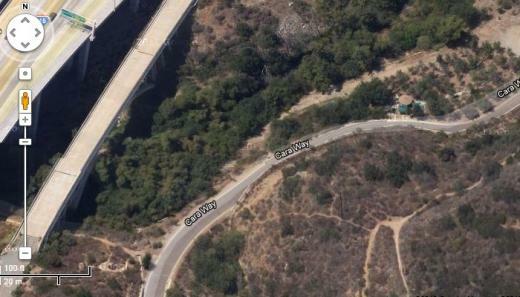 He then disposed of her body by throwing her off an abandoned bridge into the brush below. Peyer was arrested shortly afterwards. Two days after the murder Peyer was featured on a KCST- interview ride along for a segment related to self protection for female drivers. Peyers face had scratches on it during the interview. Following the broadcast several calls by other female drivers were received by the authorities. A new picture of Patrolman Peyer began to emerge. Peyer had a reputation of following female drivers and pulling them over in the same secluded location as Cara. Though most of the callers insisted Peyer was nice and non threatening, they felt an uneasy creepiness about him. All of the woman were of approximate age and physical characteristics to Cara. Several other patrolman (and woman), became suspicious of Peyer as many of them knew Peyer had a tendency to make tickets at the secluded off ramp. On one early morning briefing a colleague joked with Peyer asking if he had killed Cara Knott. The room became quiet, and Peyer began acting odd. It was then that suspicion became outright and open. The 1st trial ended in a hung jury. Upon retrial, the first-ever conviction of murder by an on duty CHP officer. In 1988 Peyer was sentenced to 25 years to life. As tragic as this these events were the story of Cara Knott was far from over. The location near where Knott was found is home to a memorial garden of oak trees to honor her and other victims of violent crime the result of efforts spearheaded by her father. Sam Knott became a nonstop advocate for crime victims following his daughters murder. He campaigned tirelessly for local and state law enforcement agencies to install technology that would allow them to monitor the whereabouts of their officers at all times. He also pressed law enforcement to ease the standard 48-hour waiting period before issuing a missing-persons bulletin to officers in the field. The loss of Cara plagued Sam and many persons attribute Peyer to Sams early death as well. Sam died within feet of where Caras body was recovered. His heart simply gave way, and he died of a heart attack. In 1995, the Cara Knott Memorial Bridge in honor of the 20-year-old San Diego State University was christened. The location has only recently become a stop for local paranormal investigators. Personal experiences of extreme feelings of grief, hot and cold spots, as well as multiple Electronic Voice Phenomena EVPs have been recovered from this memorial. 2 Responses to "Scripps Ranch Cara Knott Sam Knot murder paranormal ghost spirit haunt"
Just to let you know, Sam Knott, passed away on November 30th, 2000.